I’ve never understood the math behind Easter. It has something to do with moons and subtracting days from something-or-other, but for me, it may as well just be on a random day every year. The rest of the Lent calendar is pretty similarly obtuse to me; sure, you have Good Friday and Palm Sunday, and I get those, but there’s a lot more surrounding Lent that doesn’t really make sense to this particular Presbyterian. Today is Ash Wednesday, which kicks off Lent. And despite being aware of it for pretty much my entire life, I don’t think I could really tell you what it’s about. And, through some pretty interesting divine coincidence, it’s also Valentine’s Day, which is actually comparatively straightforward. 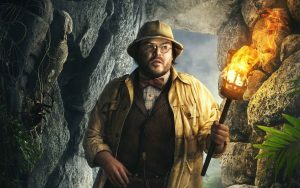 As I began researching Ash Wednesday, I found some pretty interesting (and unlikely) connections between those holidays…and last year’s movie Jumanji: Welcome to the Jungle. Yes, this article will contain spoilers for Jumanji: Welcome to the Jungle. You are thus warned. Last year’s Jumanji sequel is a silly, fun movie. It doesn’t have anything else to say, and it doesn’t really need to. 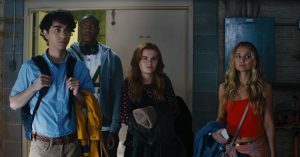 If you haven’t seen it, you can get the general gist from the trailers: four high school students are sucked into the mischevious, semi-sentient video game Jumanji. They assume the roles of wildly different and massively more capable avatars as they try to save the world of Jumanji—and themselves. Each character starts the game with three lives, shown by the three marks tattooed on their forearm. And while the bodyswap idea is used for character development and humor, it’s the lives mechanic which serves as the depeest philosophical point (if there is one) of the film: “It’s easy to be a hero when you have lives to spare,” Spencer (as Bravestone) says to his friend. “It’s a lot harder when you have just one.” But Fridge (as Moose) isn’t having it. “We’ve always had only one life to live,” he reminds Spencer, before complaining that he is quoting their high school principal. This idea is taken to its logical conclusion: when you can use lives as currency, you can more deeply explore the idea of sacrifice. Which is where Ash Wednesday and Valentine’s Day come in. The first “sacrifice” in the film isn’t exactly consensual. 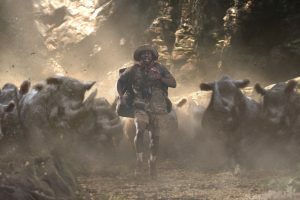 When the adventurers lose the film’s macguffin (a large crystal they must return to its statue) amid a herd of stampeding rhinos, Spencer has an idea for how to retrieve it; an idea which involves shoving Fridge out of a helicopter as a diversion, then catching him in midair as he respawns. Though justified by the story and the circumstances, Fridge’s sacrifice is still one borne of betrayal. This is a story point that clearly resonates with our hearts well. We see a similar betrayal sacrifice in one of the stories surrounding Valentinus, the man for whom Valentine’s Day is named. Though the stories are shrouded in myth and legend, a common thread is that Valentinus was arrested for performing marriages of Christians, becoming a friend of Roman Emperor Claudius II before being betrayed by Claudius and sentenced to death. So why does this story point resonate with us? Why has God written the story of betrayal and sacrifice on our hearts? If you’re familiar with the Christian faith, you know why: because Jesus was betrayed by one of his dearest friends, and sacrificed Himself. It’s this sacrifice we celebrate on Ash Wednesday, in fact; we’re reminded why Jesus needed to sacrifice Himself, and our thoughts are pointed toward Good Friday, when His sacrifice (and his saving work) was finally finished. God wants us to look to that story; for it to affect us deeply. Not just because we’re the ones He sacrificed Himself for, but because we’re the betrayers. Near the end of the film, Martha (as Ruby Roundhouse) is in a terrible situation. Her character’s one weakness is venom, and she’s surrounded by snakes. We’ve seen what happens to characters who encounter their weakness before: they explode. That’s what makes her sacrifice here even more dramatic; she knows that it’s going to hurt, and she knows that she’ll be on her last life. 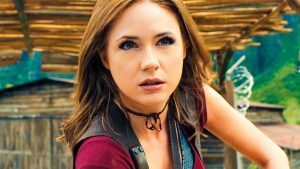 But she allows the snakes in the pit to bite her, immediately dropping her from the sky so that she can pass the magical gem to Spencer as he makes his way to the top of the jaguar statue. It’s brilliant, and it’s brave. She’s turned what looked like a weakness into a way to save everyone. Which is another thing that resonates with us because Jesus wrote it there. His humanity seemed like a weakness. It seemed like a foolish way for God to enter the world. But without that humanity, He couldn’t have died to save us all from our sins. He couldn’t have experienced life the way we do, or been tempted in every way without sinning. His courage in turning that seeming-weakness into a salvation for sinners is almost unbelievable. And, as befits Valentine’s Day, He did it for love. Probably the most poignant sacrifice in the film takes place when Alex (as McDonough) encounters his weakness: mosquitoes. In an understated, blink-and-you’ll-miss-it moment, Alex nonchalantly smacks a mosquito on his neck. In a moment of dawning comprehension, he falls to the ground, dying. But Bethany (as Oberon), who’s been shown falling in love with Alex, immediately begins performing CPR on him. When Martha points out that Bethany’s losing a life in the process of saving Alex’s, she continues heedlessly. She’s learned about love, care, and putting the needs of others above her own. Her life counter vanishes, appearing on Alex’s arm. It’s sacrifice at its most basic. And it resonates with us because it highlights why Jesus sacrificed Himself: for the love of His people. His life becomes ours. It cost Him dearly. But He did it willingly. the joy which Christ felt! It was the joy of feeding us with the Bread of Heaven–the joy of clothing poor, naked sinners in His own Righteousness–the joy of finding mansions in Heaven for homeless souls–of delivering us from the prison of Hell and giving us the eternal enjoyments of Heaven! But why should Christ look on us? Why should He choose to do this for us? Oh, my Friends, we never deserved anything at His hands! He sacrificed Himself—in a sacrifice that we remember this Ash Wednesday, in a sacrifice that we celebrate on this Valentine’s day, in a sacrifice we see echoed in our movies and books the world over—for love. So what does this mean for us? It’s lovely to know that Jesus loved us enough to sacrifice Himself for us. But what should we do in response? One of the verses we looked at earlier has the answer: run our race with endurance, chasing after Jesus. I encourage you to run that race this Lenten season: pursuing Jesus, laying aside everything that slows you down in that pursuit. Not in order to earn His sacrifice, but because He already did. Thanks for reading Redeeming Culture! Happy Valentine’s Day; may your love overflow this Ash Wednesday and this Lenten season because of the Savior who sacrificed Himself for you. 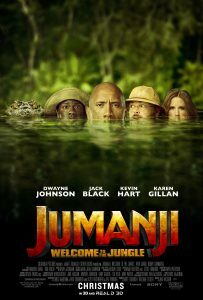 This entry was posted in Action-Adventure and tagged betrayal, Jumanji, Jumanji: Welcome to the Jungle, love, sacrifice, sequel. Bookmark the permalink.